Memphis, TN: The elegant Orpheum Theater was the venue on February 7, 2018 for “the people’s astrophysicist,” Dr. Neil deGrasse Tyson, who offered us ten things we should know about the universe – done in his usual jocular style. This charismatic director of the Hayden Planetarium in New York City and a renowned exponent of physics on television did not disappoint his jam-packed audience. Many were children as young as nine years old and eager they were to hear their hero help lead them into a possible career in science. My wife and I were there because I know Tyson as a competent heir to 1980s science popularizer Carl Sagan, an obvious Tyson hero. But I was also there because both Sagan and Tyson make excellent dialogue partners for Christian journalists such as myself who are convinced that the universe is the stage setting for the biblical drama of Redemption and yet know that science has the other half of the story (or as much as we can know). Tyson loves to take pot-shots at religious fundamentalists, but in many cases he may have a point. So here, though I am no scientist, is my Christian-based critique on his ten points, at least as far as my pen could copy. 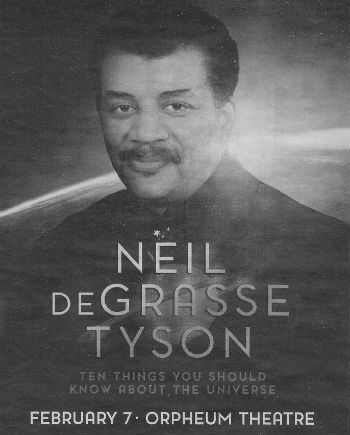 Let's follow Dr. Tyson and begin at the beginning in reverse order. Ten, the universe has a boatload of stars. The latest estimate is one sextillion stars in the known universe, that’s 10 to the power of 21. There are actually more stars than there are grains of sand on earth! That’s a lot. Later he quoted 100,000,000,000 stars in our galaxy, a number that hadn’t changed I was glad to hear since I first read it in the 1960s. No problems for Christians with this as the greater the creation (if you choose) the greater the Creator. 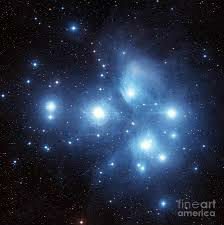 The Pleiades mentioned in Job 38:31. So the multiverse intrigues us but is not something to take to the bank – yet. True science must have a way of testing propositions, but Tyson knows this. Eight, the Universe is a time machine. Hubble telescope teaches us that light from the moon takes 1.3 seconds to reach us. That means we are seeing things as they were 1.3 seconds ago. In Orion we see stars that have been born in explosions but we presently see them as they were eons ago. Orion happens to be mentioned in the Bible three times (e.g. Job 9:9) so no big deal here for any Christians who do not subscribe to the 6000 year old creation. Seven, the Universe is big, molecules are small. There are more water molecules in a glass of water than glasses of water in all the world’s oceans. The water we use and which comes from our kidneys (laughter) find its way back into the ecosystem. 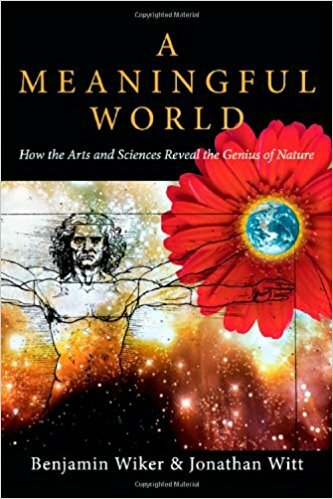 “Thus there is a connectivity that scatters and yet joins us all.” That, again, is part of the transcendental gloss the Sagan-Tyson school puts on things and makes it appealing to so many. Six, Earth…wants to kill us! Tyson’s natural humor and kinetic gestures lighten up this section. Killer asteroids, comet impacts, earthquakes, tidal waves – “these are not good for our health.” Thus, “when we speak of the good earth we are speaking of that small minority of the surface that is habitable.” This is a good point for Christians to ponder. Yes, there are spectacular sights – the Grand Canyon – but no one wanted to be around when it was being scooped out. “There have been more species rendered extinct on this planet (97%) than exist today.” This is a sobering fact but fits the Biblical grid of “guided catastrophism” reflected in numerous texts such as Isaiah 13:9-13. This is all very fascinating but a Mars meteorite or two does not a complicated species make – at least not yet. But again, intriguing, if we keep in mind we are speculating from miniscule bytes of evidence and not subjecting the data to rigorous proof – one of the hallmarks of science. Fourth, Carbon is king (or something like that) and here his lecture began to dim momentarily. Carbons bond everyone and everything and this is part of his “connectivity” argument. I thought of the first Star Trek movie in 1979 where the crew of the Enterprise was referred to as “carbon units.” Point taken. Nothing earth-shaking here. That is very close to the Carl Sagan quote that was offered to me by a progressive seminary professor that “we are animated star dust.” A provocative thought. This obviously gets beyond Adam and Eve and the literal creation account but it does echo a range of other texts from Isaiah 40-51 that are written from a cosmic “out of this world” perspective. There are four ot five creation accounts in Scripture – a fact not usually considered. What we can appreciate about the Sagan-Tyson school is the need to inject some sense of purpose or meaning in what we see around us. This at least is an obvious attempt to forge a satisfying conclusion for believers in strict materialism. Christians will reply that to be made in God’s image – the theology not the geology of Genesis 1 – gives us all the relevance and meaning we could possibly desire. In the end, Tyson’s presentation was more an entertaining update than a hard-core science lecture but the children in the audience seemed to be impressed. Good. A sense of awe and wonder engendered this early can lead to some surprising developments later. For, in the end we all benefit when both science and religion keep open minds as they engage each other. Science writer John Bell writes that “we have reached the end of human capacity to form a sharp picture of what is going on,” when it comes to the Universe. Hence the need to escape the dilemma through Mars rocks and exploding gas clouds. Conservative Christians are convinced that the One who calls all the stars by name did the creating (Isaiah 40:26) but he hasn’t shown us how. He’s hidden the flow charts. That means the dialogue must continue and it helps to do it with a sense of humor and panache as represented by Neil deGrasse Tyson.